I found out about Citi's new blog launch on Jim Bruene's excellent NetBanker blog, and I recommend you read Jim's take. I don't want to re-invent the wheel, so I won't insist on the design of the blog or the number of comments. Yes I agree with Jim, it is a good idea and definitely a step forward for the bank which is trying to be more transparent. I decided to write this post because I found a few interesting pieces of news while I was assessing the visibility of the blog on Citi's website and its online coverage. Search on Google.com - "citi blog"
citibank is so not fabulis on his blog. Hi everyone. Jason Goldberg here, founder and ceo of fabulis. In a bit of strange and disturbing news, fabulis discovered today that someone(s) at Citibank had decided arbitrarily to block fabulis’ bank account due to what was described to us on the phone as “objectionable content” on our blog. In fact, the account — it turns out — was blocked a few days ago without anyone letting us know about it by phone or email. When did Citibank start reviewing blogs to decide who can bank with them? The story was covered by ZDNet.com the following day, and Reuters.com published a comprehensive summary of the whole story on March 5th. It reminded me of the Bank of America story from last september and the DEBTORS REVOLT BEGINS NOW! video on YouTube which now counts over 500,000 views and over 6,000 ratings. You will see my point in Ann Minch's video update DEBTORS UPDATE: BANK OF AMERICA RESPONDS!!!. Search on Citi.com - "blog"
I couldn't find any mention of the blog on Citi's website which didn't really come as a surprise. Now, it is time to share my comments on the blog. First of all, I believe it would be interesting to see the list of suggestions and questions, categorized if possible. Moreover, I am curious to find out how the Citi team identify the most interesting ones, how they plan to respond, and how those questions will impact their editorial line on the blog. Most of the articles were posted by "Citi" i.e. whoever is in charge of producing the content for the blog. This is far too impersonal and doesn't fit the raison d'etre of a blog. To the contrary Citi should take this opportunity to give a voice to its employees and give their audience the opportunity to connect more with the content. Even though it is great to see a post from the CEO himself, Vikram Pandit, How Citi is changing., the message is too polished and comes flat. It could easily have been written by the CEO office. I would like to clarify straight away that in all fairness you can't really expect to see a CEO of such a sizable banking group commit to produce specific articles on regular basis on a blog. On the other hand, I strongly believe that the video format is a perfect fit for busy Senior Executives. Words often fall flat, and It is important to see the passion, the determination, and the leadership. If you are looking for best practices from Banking Senior Executives, I would point you to Peter Aceto, President & CEO at ING Direct Canada who brilliantly demonstrates his leadership on twitter @CEO_INGDIRECT, and I would invite you to follow Gerd Schenkel, Managing Director of UBank, on twitter @GerdSchenkel. I have identified 40+ Senior Execs contributing on twitter, blogs, facebook, or YouTube. I invite you to check my list of Senior Executives on twitter. The American Banking News journalist reports that customers use the blog to complain and that some people were suspicious regaring positive comments which "might have been written by Citibank employees". That is old news. Any financial institution, if not any company from any industry, which launched a blog experienced the same skepticism at first. It is their commitment to post on regular basis and respond to comments which helped them change people's perception. I know it is early stage and Citi will surely learn and improve, but I am a bit concerned with the low number of responses posted on the blog by the Citi team. Let me use the most commented post as example, How Citi is changing. : 60 commments were left including only 3 responses from Citi. It seems a bit low for a blog which aims to create dialogue and a team which promise they're listening, don't you think? Please note that citi forces you to give your email address to leave a comment. Even though I doubt it, it means that the Citi team may respond to the comments directly via email. I still believe they should prove their total commitment by responding to most of the comments on the blog. I wonder who moderate the blog, how often Citi check it for new comments, and what their selection criteria is for deciding on who to respond to. In the last 5 years, Wells Fargo arguably became one of the most experienced banks worldwide in social media and in dealing with the delicate challenge offered by user-generated content. The bank launched an innovation lab, a few user-generated video contests, and leveraged virtual worlds, twitter, and of course blogs. A couple of years ago, Wells Fargo became one of the founding members of the Social Media Business Council (formerly known as the Blog Council). I invite you to read some of my previous posts on Visible Banking. Four years and two days after the launch of their very first blog, Guided by History, Wells Fargo launched the Environmental Forum, its 6th blog, 5 publicly available plus the CEO blog for their commercial banking customers. In my video interview with Tim Collins, WF's SVP Experiential Marketing, Tim confirmed that blogging was just an experiment when they launched Guided By History back in March 2006. Very few banks were blogging back then, so the blog was supposed to be temporary and last for roughly three months... In January 2009, they revolutionized the banking world when they launched The Wells Fargo Wachovia Blog to cover the sensitive merger with the two banks... What a journey the Stage Coach has experienced in the past 4 years! Wells Fargo's extensive hands-on experience in blogging is second-to-none in the cautious banking world: I highly recommend you check their social media guidelines and their excellent content strategy (12-month editorial line, dozens of contributors from all across the organization, tone of the articles, and info shared which goes far beyond just sharing some news on the bank). Brilliant. So far, two posts have been published on the blog and the team identified 4 key categories of articles: Customers, Communities, Team members, Operations. This is a good number. The less, the better. It looks like Wells Fargo has identified 4 key contributors: Mary Wenzel, the director of Environmental Affairs, Ashley Grosh, Project Manager for Environmental Affairs, Krista Van Tassel, Environmental Affairs team, and Stephanie Rico who is in charge of external communications and marketing for WF's environmental efforts. I enjoy the design of the Wells Fargo blogs, simple with a clear call to action. For the time being, the main call to action on this blog is to visit the bank's environment affairs and green buildings pages on their corporate website, or download a 7-page pdf document. One must say that the landing page is far from being as sleek as the blog they just left: too much text and so many links to choose from... The Green Buildings page is slighty better though. Leveraging social media is a great way to give more visibility to existing content on your site as well as existing initiatives from the bank. It gives you a unique opportunity to support your effort using a different tone of voice, and better connect not only with your clients but the american nation. At the same time, you will urge people to get back to you with their comments, their concerns, their ideas. In the last few years, corporate blogging established itself as one of the most efficient, and cost effective, ways to create conversations and drive brand advocacy. * connect on Facebook and MySpace. Historically, WF has never been very active on those social networking sites. Neither has the bank ever tried to launch its own online community, contrary to Bank of America or American Express. The team listed all the key social media initiatives from the bank. This is essentially their own social media newsroom. Thanks to their commitment to blogging, Wells Fargo consistantly increased the amount of traffic to blog.wellsfargo.com. A year ago, the blogs enjoyed a cumulative 17,000 unique visitors per months. In October 2009, they reached a peak of over 30,000 unique visitors and now they are back to a good 25,000 monthly unique visitors. Now, I would like to share with you some of the stats from my Visible Banking Blog Watch Series (now I am tracking 199 blogs in 20 countries). 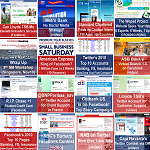 Between September 2009 and February 2010 Wells Fargo published an average of 8 posts on all their four public blogs. Nevertheless, the level of activity varies quite a bit from just a modest 1.18 comments per post on average for the Student LoanDown, up to a 11.18 comments per post on average for the Wells Fargo - Wachovia blog which is one of the highest level of engagement in the industry. John Kirkbright, invited me to speak at "Social Media Revolution and Impact on Financial Services", the conference he organized for the EFMA in Paris on 19th March 2009. The event had speaker panels and interactive sessions to facilitate exchanges of information and ideas between a strictly limited audience of senior European banking executives from over 10 countries. Jean-Michel Billaut, Founder of the Networking Company, is one of the first people I met at the EFMA event in Paris last week. We shook hands and introduced ourselves just to find out that we had both been following each other's blog for quite sometime! I was delighted to meet Jean-Michel at last. He is one of the most well-known bloggers in France or shall I dare to say 'in French'. If you can read French, I highly recommend to subscribe to Jean-Michel's blog 'Vivement la retraite a tres haut-debit et en 2.0 naturellement'. We ended up sitting next to each other and sharing our views on social media for most of the day. We even talked about the 'Social Media & Finance' Workshop I organize in San Francisco on April 29th (on Jean-Michel's birthday! What a coincidence...), and Jean-Michel was able to give me a few key contacts in the San Francisco Bay. I want to mention that Jean Michel has been promoted « Chevalier de la Légion d’Honneur » (the high french distinction) by President Chirac for the promotion of the Internet in France. Jean-Michel wasn't one of the speakers, but he was invited by one of the connections we have in common, Patrick Desmares, EFMA's Executive Director. Haymarket Events, the company behind PR Week, invited me to contribute to their event on Social Media, "PR, Social Networking And Blogging In Practice" in London on 27 January 2009. I am delighted to be part of the excellent line up of speakers from the following companies: AOL People Networks / Bebo, Cadbury, Cafédirect PLC, British Heart Foundation, E.ON, FT.com, Guardian.co.uk, LOCOG, M-Brain, MORE TH>N, Motorola Inc., MySpace, NixonMcInnes, Randomreality.org, The Spectator, Vodafone Group PLC and Visible-Banking.com. I have been invited to participate to the Bloggers' "Speak Out" Panel scheduled at 2:20pm. Please find below the topics we will debate. Earlier this week, Tim Collins informed me of the launch of the latest Wells Fargo blog, The Wells Fargo - Wachovia Blog. The goal of this new blog is to support the recent merger with Wachovia. You are aware of any other social media initiatives used to support a merger? Please don't hesitate to leave a comment! Again, the Experiential team at WF came up with an innovative way to leverage social media. It shows that Wells Fargo is still "the most web 2.0" bank in the world. Congrats to Tim, Ed, and the rest of the team. I am not the first blogger to cover this launch (check those results on Google blog search), and I invite you to read the related post by Chris Skinner. Not only will I share my initial comments with you, but I will also review their most commented article so far. As mentioned in my recent posted item on the Visible Banking Page on Facebook, I believe it is a real gem. It should give you some great insights on the opportunities & the challenges offered by social media. Since 2005, the Experiential team have been busy launching many social media initiatives in blogging (5 blogs to date), video sharing (centerstage and someday stories) and virtual worlds. It shows on this blog, Tim's team definitely know what they are doing. * Blogging policy & guidelines: there is (of course) a moderation process, and if you don't respect the rules don't expect your comment to be published. Fair enough. It also helps WF to deal with spam and abusive comments. * The box to leave a comment, with a picture: genius. It makes it easy to leave your comment even if you don't know anything about blogging. It is also great to put a face on a name, it urges you to get in touch with the contributors. * Employee advocacy: giving so much visibility to your employees is an efficient way to drive employee retention and employee advocacy. Your employees become "rockstars"! In this case, they have the opportunity to participate to a unique initiative in banking. * John Stumpf himself, John is Wells Fago's CEO, wrote the first blog. Great way to demonstrate the blog is serious and credible. But John didn't respond to any of the comments. Please note that Ed Terpening, VP Social Media at Wells Fargo responded to a few comments himself. Focus on the most commented post so far - Matt Wadley: "This Blog Is About You"
Congrats to Matt for such a popular post which counts over 55 comments. Please find below a few screenshots illustrating the following points. Giving exposure to your employees and your clients is an excellent way to drive advocacy and retention. Employees, customers, and subject matter experts will be enthuastic, and will respond to any negative or abusive comments themselves. Show you listen, and action the best suggestions listed in your comments. I am delighted to see such a promising take off of the number of fans. The page now counts 70 fans. 31. Vikash Shah, Management - Development Program at Flagstar Bank (USA): please check Vikash's Kiva profile. Congrats for your 47 loans! 32. Stephanie Rogers, Senior Director, Contact Planning at PARTNERS+Simons (USA): please check Stephanie's "CultureJunkie" blog. 33. Thirugnanasambandan Singaravelan, Managing Consultant at IBM Global Business Services (Singapore): 18 answers in Linkedin, member of "Bankers Alliance for the Mobile Arena" (BAMA) created by a fellow blogger, Brandon McGee. Thirugnanasambandan contributed to the topic on Facebook on the discussion board. I invite you to check Tevan's webiste. I look forward to catching up with Thirugnanasambandan when I am in Singapore for Retail Banking Innovations in early October. 34. Benjamin Davies, Innovation Architect at Lloyds TSB (UK): I work with Benjamin. Great guy. 35. Ben Knieff, Director, Strategic Research and Development at Fidelity National Information Services (USA): Ben has been very active on Linkedin with 28 answers. Ben is a member of the "Payment and Fraud Professionals" Group on Linkedin. I like the term "Fraud professionals". :) I used to be one myself hen I was International Sales Manager for Accuity, a leading Payment and AML solution provider. 36. Jatin Dewan, Requirements Manager at Citibank (USA): Citibank provides one of the most successful online banking services in the US. Jatin went to the National University of Singapore. 37. George Pasley, E-Commerce Developer at First Federal (USA): I invite you to check George's "Banking Kismet" blog, and his twitter account. 39. Pieter Lambrechts, Account Director at Boondoggle (Belgium): Pieter lives near the gorgeous city of Gent. Don't hesitate to leave a comment or post any relevant items. No activity this week. Don't hesitate to contribute to the discussion board, and post your own topics! Video challenge: 10 "good" reasons not to embrace social media! I invite you to read my recent post entitled "Banking 2.0: 10 "good" reasons not to embrace social media". Please don't hesitate to leave a comment and add a new reason to the list: challenge me! I will post a video response for every single additional reason. First, I invite you to read my post entitled "Banking 2.0: 10 "good" reasons not to embrace social media". It gives us a unique opportunity to connect not only with our clients, but the whole market. It gives us the opportunity to show we listen and we care. It will help us drive customer advocacy. I will publish a video response for every single reason I listed. Please find below my response to the reason around the ROI for social media projects. What do you think a my video (content, format)? I created the initial post to start a discussion. An interactive online discussion. I will publish a video response for every single reason I listed. Please find below my response to my all time favourite reason "UGC is too risky". Social Media, UGC... It is too risky! I am delighted to see such a promising take off of the number of fans. Twenty days after the soft launch, the page now counts 58 fans. 21. Joris Huijbregts, Senior interaction designer at Info.nl (Netherlands): Joris mentioned on his profile that he is currently "working on a project for a major bank in the Netherlands..." I invite you to check Joris' blog. 22. Aliza Mor, Conference Producer at Marcus Evans (USA): I met Aliza at Online Retail Banking Services 2008 in May in New York. I was invited not only to speak but also to the chairman of the two-day conference. Following the success of the event, Aliza invited me to participate to another event in Miami, but I couldn't make it. I believe Aliza is now working on Marcus Evans' Innovative Payment Strategies event. 24. Jean-Christophe Capelli, Co-Founder at FriendsClear (France): I first met Jean-Christophe a few days before the first ever Finovate in New York. We had dinner in Manhattan. Jean-Christophe is passionate about social lending, and he recently co-founded FriendsClear. I invite you to check JC's blog in French. 25. Andy Berlind, Sponsorship Consultant at Wells Fargo (USA): Andy works for the innovative US bank Wells Fargo. I invite you to check my video on Wells Fargo 2.0. No wonder Andy is connected to his colleagues Tim Collins and Ed Terpening. 26. Sally Herrington, Vice President e-Business at GTE Federal Credit Union (USA): Sally is actively involved in online banking and personal finance management projects. 27. Tuomas Toivonen, Co-Founder at Scred (Finland): Scred is a "peer-to-peer financial service". I invite you to check Tuomas' blog. 28. Panos Kontopoulos, Business Unit Manager at paperplane (Greece): I invite you to check Panos' blog in Greek, "Mental block". 29. Denis Vacher, new means of payment at Orange (France): Denis worked at Cedicam for 11 years. He surely worked with one of my friend, Christian F-E. I invite you to check Denis' blog. 30. Eric Di Benedetto, Angel Investor at Active Starts (USA): Eric has invested in many innovative companies such as Lending Club and ClairMail. Don't hesitate to leave a comment. Thanks to Aden for his contribution to the Facebook vs Linkedin discussion! In the last 15 months, I had the opportunity to participate to many industry leading conferences in the US and in Europe. I am always delighted to share my vision and my passion for social media with my peers. 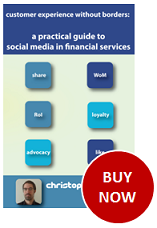 Fact is there are still too few bankers who get social media and web 2.0. And there are still too few social media champions and evangelists in the banking industry. Social media is not a big threat to the banks, it is a Great opportunity to connect with people and show we care. During my presentations, I use the same words over and over again: customer advocacy, transparency, honesty, engagement, Reward. But is it enough to convince the whole industry? Probably not. I decided to adopt a different approach. I plan to identify all the reasons not to embrace social media. I identified 10 "good" reasons so far, but it is just a start. I invite you to contribute: please feel free to leave a comment and flag any additional reasons! 1. We have already tried! I plan to shoot a short video for every single "good" reason listed in this post (including the ones you flagged in your comments). My goal is to challenge all of them, and demonstrate we don't have a choice anymore: social media must be part of your digital media / online marketing strategy.